Hilman Industries, Inc. is a wire-harness, cable, and electro-mechanical assembler serving small- to mid-sized OEM's and contract manufacturers who don't have the desire or tooling to assemble in-house or don't have the quantity requirements of large cable houses. 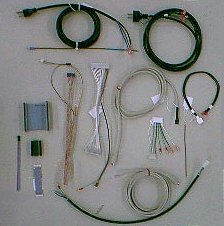 We can supply almost any type of custom wire harnesses and cables for contract manufacturers, assemblers, and OEM's from 1/2 inch 30AWG jumper wires for board modification to multi-wire harnesses using both standard and nonstandard components. Customer service and highest-quality workmanship are our priorities. We take great personal pride in our work, and maintain an almost nonexistent nonconformance rate. We are also very competitive on pricing, and we work hard to meet or exceed our customers' expectations. Please take some time to look around and see what our capabilities are and what we have to offer. If we provide a product or service that you're looking for, let us know. If you're not interested in what we have to offer right now, please bookmark our site for future reference. We would like the opportunity to serve you and your company, and will do whatever we can to make sure that your experience with us is a pleasant one. We think you will be very satisfied with the level of personal attention given to you and your wire and cable needs. Please Note: This information on these pages is intended to reflect our process capabilities or as general information to help aid in materials selections for wire harnesses or cable assemblies. At this time, Hilman Industries does not manufacture wire or cable from raw materials.